A 14-year-old Aboriginal girl posted a cry for help on social media before she took her own life just hours later. Only one friend replied and later that night her father Geoffrey found her unconscious in her bedroom. The schoolgirl died in hospital nine days later on January 10, making her the fifth Aboriginal girl to commit suicide in the past two weeks. Her sister Kyanne described her as 'sweet, happy and funny' but said she was worried that her friends had 'turned against her' and said she was being bullied. In August, Rochelle was involved in an altercation outside the school gates and came home with cuts on her legs. Her mother said after that she didn't want to go in to school anymore and her mental health went downhill. Friends paid tribute to the youngster, who loved animals and one day dreamed of going to university. One fellow student wrote on Instagram: 'My vision is so blurry from my tears … come back please. 'The last day we were talking about what colour you should dye your hair and you were thinking about… blue or purple. The recent wave of suicides affecting the Aboriginal community include three cases in Western Australia, one in Queensland and one in South Australia. In addition, a 12-year-old boy was treated in hospital in Brisbane after a suicide attempt. The five most recent cases began on January 3 when a 15-year-old from Western Australia who was visiting relatives in Queensland was admitted to hospital after self harming. She died two days later as a result of her injuries. 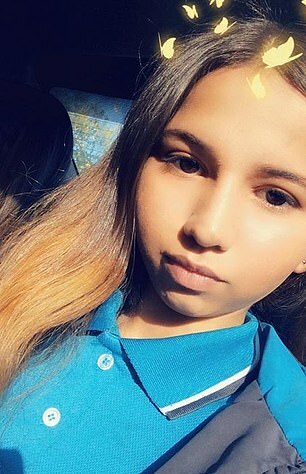 On January 4, in South Hedland in Western Australia, a 12-year-old girl took her own life, while two days later on January 6, a 14-year-old girl in the Kimberley region of the Northern Territory also died from suicide. Head of the Federal Government's indigenous critical response team Gerry Georgatos said that poverty was a major factor in the deaths but that sexual assaults were behind one-third of cases. Indigenous lawyer Hannah McGlade, who has advised the UN High Commission for Human Rights in Geneva, said there is a clear link between child sexual assault, family violence, and the high levels of indigenous girls and women who were taking their own lives. 'Last year the UN highlighted the level of violence against indigenous women and girls in Australia and called for a specific national action plan,' Dr McGlade told The Australian. JANUARY 3: Girl, 15, from Western Australia self-harms in Queensland and dies two days later. JANUARY 4: Girl, 12, kills herself in Western Australia. JANUARY 6: Girl, 14, commits suicide in the Northern Territory. JANUARY 10: Girl, 15, dies from suicide in Perth. January 11: Girl, 12, kills herself in a community near Adelaide.